If you would like to trial robotic assistive technology devices with your own patients, contact us as we have systems ready to be installed at your clinic for a 3 month period. We are pleased to offer Hocoma‘s C-Mill treadmill, the Andago body weight support system, and the ArmeoSenso upper limb rehabilitation device. The clinical trial includes us installing the equipment at your facilities for a small fee, and giving your staff full training so your patients can feel the benefits themselves. After 3 months, you can either purchase a system or return the equipment to us. It’s as simple as that. If you would like a clinical trial of any other Hocoma device, please contact us and we’ll be happy to discuss this with you. We have been pleased to work with the C-Mill treadmill for a number of years with our partner Motek. Now distributed by Hocoma, the C-Mill is a treadmill containing a force plate which evaluates and trains gait and balance. It uses movement, virtual reality (VR) and augmented reality (AR) as part of the therapy process. The C-Mill allows for gait adaptability strategies through obstacle avoidance in a safe and controlled environment. The C-Mill treadmill is ideal for a wide range of patients requiring rehabilitation for neurological conditions, brain and spinal injuries, stroke, Parkinson’s Disease, movement disorders, amputees, cerebral palsy, stability training, and fall prevention. It is suitable for paediatrics and geriatrics alike. You can read testimonials about the C-Mill from the Portland Hospital for Women and Children, The Brain and Spinal Injury Centre (BASIC) and Mike Jones, a lower limb amputee patient at the Morrello Clinic. We also have a case study written by Jakko Brouwers and Sarah Harling from the Morrello Clinic. For all our testimonials, click here. The Andago is an innovative free-moving robotic body weight support system, which bridges the gap between treadmill-based gait training and free overground walking. The Andago actively follows patients while they are supported in the self-directing robotic device. As the Andago is hands-free and is flexible to use from room to room, this means therapists aren’t exposed to physical strain and don’t have to focus on the security and stability of their patient. Instead, they can focus purely on delivery high-quality therapy for the patient. 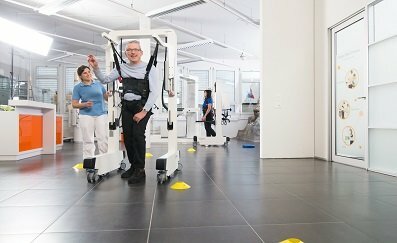 The Andago is suitable for patients who are currently unable to walk completely unsupported, such as patients recovering from Guillain-Barre Syndrome, spinal cord injuries, balance disorders, walking disabilities, neurological disorders, musculoskeletal disorders, geriatrics conditions, Traumatic Brain Injury (TBI), Parkinson’s Disease and stroke. You can see the Andago used at the MINT 2018 event here. The Andago was recently awarded the prestigious “Excellence in Business to Business” award by the the German Design Council’s German Innovation Award. Read more. The ArmeoSenso, part of Hocoma’s Armeo range, is a new development in the field of upper limb rehabilitation. The ArmeoSenso consists of a set of sensors, which are attached to the chest, arm and wrist, and a hand module which patients can move around and squeeze. Highly-intensive, self-initiated and motivating, the ArmeoSenso enables patients to complete precise and repeatable assessments. The ArmeoSenso comes with a wide range of exercises and games, so the patient can interact with the hand module’s Augmented Performance Feedback and gripping function. The ArmeoSenso can be used by any patient experiencing moderate to mild impairment of their arm or hand movement, for example patients recovering from stroke.